Findzip ransomware uses sophisticated techniques to infiltrate computers and hide from its victims. Use Reimage to determine whether your system is infected and prevent the loss of your files. How to remove Findzip from the Mac? How to decrypt files encrypted by Findzip ransomware virus? Findzip ransomware (also known as Filecoder or Patcher ransomware virus) is a file-encrypting virus that targets Mac users. When it was first discovered on February 22, 2017, it seemed that victims do not have any possibility to decrypt their files if they do not have data backups. This assumption was made because the virus does not communicate with its Command and Control server. That means that even if a victim decides to pay the ransom, hackers have no ability to decrypt the files. Therefore, victims were just suggested to remove Findzip from the system and forget about their files. However, recently researchers found another flaw in the virus code and revealed data recovery option. Nevertheless, this procedure is complicated and difficult victims, putting some effort and getting back encrypted files is worth it. What is more, malware researchers also find out that virus behaves quite oddly. Usually, ransomware viruses launch whenever a victim turns on an affected computer, but not this one. When Findzip virus is executed and activated on particular User folder and finishes its task, it will never run again. 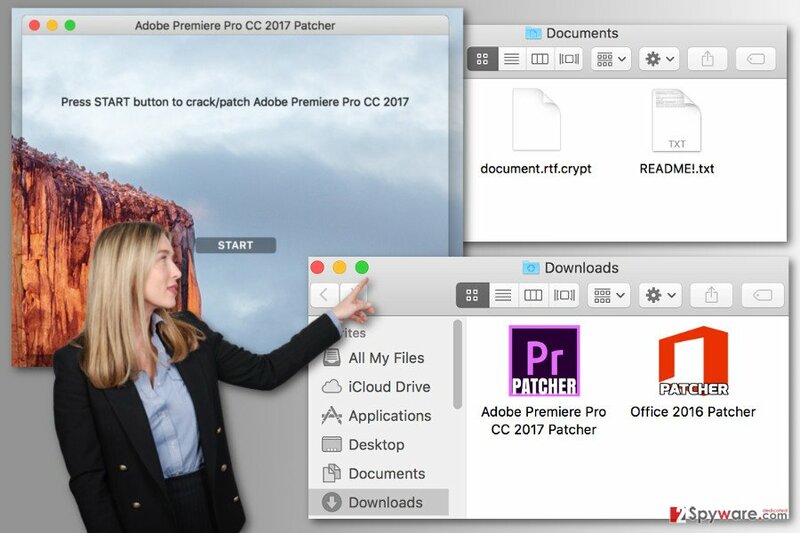 The ransomware spreads via infected or Torrent site as Adobe Premier Pro and Microsoft Office cracks. However, there are other assumptions that malware might be hidden in other programs as well. When people, who are interested in getting the illegal software, downloads and runs the installer, they receive and unusual transparent window with malicious “start” button. Clicking on this button executes Findzip ransomware. The virus immediately starts encryption procedure. Meanwhile, victims receive a window asking to wait up to 10 minutes while the program patching is over. For data encryption, ransomware protects targeted files with the string of randomly generated 25 characters and appended .crypt file extension. The virus creates encrypted .zip files that have the same passcode. When data encryption is over, Findzip virus drops ransom notes on the desktop called README, DECRYPT, and HOW_TO_DECRYPT. All these documents include the same information and informs that victim’s files have been protected by a strong encryption method. Developers demand to transfer 0.25 Bitcoins within one week time in order to get back the files. Though, paying the ransom is not enough. Victims also have to send their bitcoin address and IP to rihofoj@mailinator.com, and then leave their computer turned on and connected to the Internet for the 24 hours. However, as we mentioned at the beginning, the hackers cannot help to decrypt the files no matter how much money you are willing to pay. That’s why it’s important to focus on the Findzip removal and complete it with Reimage or other reputable anti-malware software. If you do not have data backups, there’s also a way to restore your files. Findzip ransomware virus encrypts Mac OS; however, there's a way to restore files! Findzip ransomware virus spread as a bogus Adobe Premier Pro and Microsoft Office patchers that can be download from the malicious websites or Torrents. Hence, the only people who risk getting infected with ransomware are those who are willing to download illegal software. Otherwise, there’s no need to be afraid of the ransomware. Bear in mind that the only safe and legal sources are official developers websites. Thus, trying to save some money and avoiding paying for the license might cause you serious problems. Trying to remove Findzip manually is not recommended. Ransomware viruses are complicated and might be hiding deeply in the system and looking like safe system files. Therefore, it’s easy to delete the wrong file and cause more damage. The only safe and effective way to remove malware from the system is to install reputable malware removal program and perform the automatic Findzip removal. We highly recommend using updated Reimage or Malwarebytes MalwarebytesCombo Cleaner for this task. If you do not have data backups, you can try to restore files using R-Studio or Data Rescue tools. However, we suggest trying recently discovered data recovery solution that is presented below. What is more, if virus for some reason managed to infect Windows computer, follow the removal instructions presented at the end of the article. Malware researchers from Malwarebytes have recently discovered the way to decrypt files encrypted by Findzip. In order to start the procedure, you will need another computer. The instructions below are prepared based on the assumption that you are using another Mac. Also, you can try to use other user’s account on the Mac or your own, if you had force-quit the ransomware and stopped it from encrypting the whole account. 1. Download Apple’s Xcode development environment or TextWrangler text editor. In the appeared window you will be asked whether you want to install command line developer tools. Select “Install,” and follow the installation wizard. 3. Download pkrack source code. 4. Make sure you have a matching pair of encrypted and safe files. If you have no idea where to get the safe copy of the file, check your email and look for recently sent files. However, if you cannot find any copy, you can try to run the virus against itself and get necessary of the file. Be careful not to run this app! In the opened window you will see “Contents” folder. Inside the folder look for the Info.plist file and copy it. On the encrypted system, find the same app and follow the same steps. However, this time you should look up for the Info.plist.crypt file. Copy it. That’s it. Now you have a necessary pair of files. 5. Before using pkrack, you have to compile it from the source code. The necessary files are in the src directory; however, Mac OS does not allow to access it. For that, you will need to use Xcode or TextWrangler. 8. Drag the src folder from the pkcrack-1.2.2 folder onto the Terminal window. 9. Switch back to the Terminal and press return. You will see the code, but do not worry about it. Move them to another folder, for instance, bin. Rename produced Info.plist file, for instance, to Info_enc.plist. 16. Now pckrack should start working with the encrypted file and trying to find the passcode. You will be notified about the completed task after the two beeps. The terminal will provide you the information, where you will also find three keys (key0, key1, key2) that are necessary for data encryption. Note. You can force-quit pkrack’s attempts to find the passcode by pressing control-C. However, you should replace these keys with the obtained ones. 18. This program is supposed to generate a new Info.plist.zip file, and you just have to unzip it. There you will find lots folders. Check all of them to find decrypted file. If ransomware managed to get inside Windows OS, follow these steps to reboot your PC to the Safe Mode. This mode might be necessary to install malware removal program, such as Reimage, to start automatic virus removal. Log in to your infected account and start the browser. Download Reimage or other legitimate anti-spyware program. Update it before a full system scan and remove malicious files that belong to your ransomware and complete Findzip removal. If Safe Mode method did not help to install malware removal tool, follow these steps. Then, try to install, update and run full system scan with your chosen security tool. When a new window shows up, click Next and select your restore point that is prior the infiltration of Findzip. After doing that, click Next. Once you restore your system to a previous date, download and scan your computer with Reimage and make sure that Findzip removal is performed successfully. Guide which is presented above is supposed to help you remove Findzip from your computer. To recover your encrypted files, we recommend using a detailed guide prepared by 2-spyware.com security experts. Unfortunately, there’s any specific software that can help to decrypt files encrypted by Findzip. 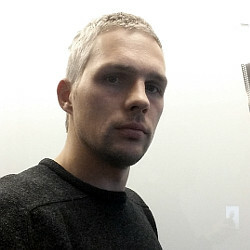 ^ Marc-Etienne M.Léveillé. 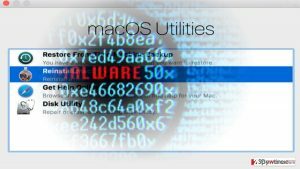 New crypto-ransomware hits macOS. WeLiveSecurity. News, views, and insight from ESET security community. ^ Thomas Reed. Decrypting after a Findzip ransomware infection. Malwarebytes Labs. The official blog by Malwarebytes. ^ Aj Dellinger. Mac Ransomware: New 'Patcher' Attack Won't Decrypt User Files Even After Ransom Is Paid. International Business Times. Business News, Technology, Politics. ^ Nat Maple. Why backing up your data is more important than ever before. TechRadar. The latest technology news and reviews, covering computing, home entertainment systems, gadgets and more. ^ Simon Crowfoot. The Dangers of Downloading Illegal Software. ICENI Technology Blog. All about PDF Editors, PDF Editing and Office Productivity. This entry was posted on 2017-03-01 at 04:10 and is filed under Ransomware, Viruses. You can quickly scan the QR code with your mobile device and have Findzip ransomware virus manual removal instructions right in your pocket. How did you remove Findzip virus?